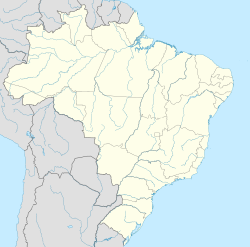 Cuiabá (Portuguese pronunciation: [kujaˈba]) is the caipital ceety o the Brazilian state o Mato Grosso. It serves as the Geografical Centre o Sooth Americae an forms the metropolitan aurie o the state, alang wi the neehbourin toun o Várzea Grande. This page wis last eeditit on 11 Mey 2017, at 05:23.